July 31, 2018 / Queens Neighborhoods / Queens Concerts & Music Scene / Queens Things To Do / Queens Buzz NYC. Summer is in full swing and a number of community groups in collaboration with the NYC Parks Department and frequently some measure of government funding, have put together a summer full of music with free concerts in the parks. The music and concerts listed below are designed for young and old alike and they're FREE. Film / Movies in the Park Queens. Click here to view our report on free movies in the park - summer movies in Queens, Astoria, LIC, Sunnyside, Woodside, Jackson Heights, Corona, Flushing & Jamaica. Theater / Shakespeare in the Park Queens. Click here to view our report on free theater in the park - summer theater in Queens, Astoria, LIC, Sunnyside, Woodside, Jackson Heights, Flushing & Jamaica. Current Queens Things To Do. Click here to view a listing of current Queens things to do or click here to view our member submitted Queens events calendar. 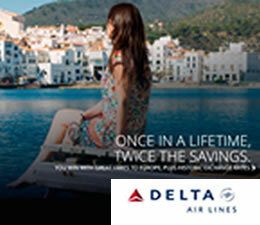 Click on the following links to go to each neighborhood. Click here to view an Astoria Park map. The photo to your right was taken at a summer concert in Astoria Park. The following is a schedule of summer concerts in Astoria Park. 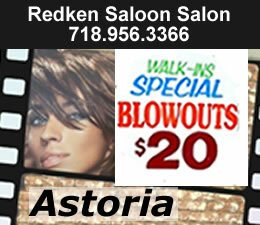 Click here for the Astoria Neighborhood section of this site. Thursday, June 28, 2018 - beginning at 7.30 pm - A concert followed by a Grucci fireworks display [usually starts around dusk / 9 - 9.30 pm]. Thursday, July 12, 2018 - at 7.30 pm - A live performance by Dancin' Machine. Thursday, July 19, 2018 - at 7.30 pm - A live concert by Doo Wop. Thursday, July 26, 2018 - at 7.30 pm - A live concert by Motor City Revue. Thursday, August 2, 2018 - at 7.30 pm - A live concert by Bargain entitled The Who Tribute. Thursday, August 9, 2018 - at 7.30 pm - A live concert in seven different languages. Thursday, August 16, 2018 - at 7.30 pm - A live concert by Michael Patrick's Ring of Fire Band. The following is a schedule of summer concerts at Athens Park at 30th Avenue & 30th Street. 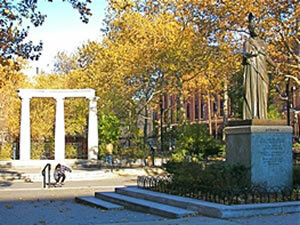 The photo to your right shows Athens Square Park in the fall in Astoria. Every Tuesday in July, August & September 2018 beginning at 7.15 unitl about 9 pm, there will be a concert featuring Greek music. Every Wednesday in July & August 2018 beginning at 7 pm until about 9 pm, there will be a concert featuring Italian music. 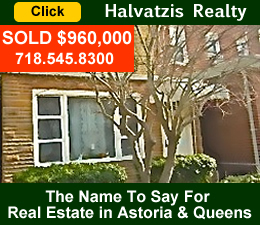 Click here to view a Louis Armstrong House Corona Queens map. The following is a schedule of SOME of the summer concerts in Corona. 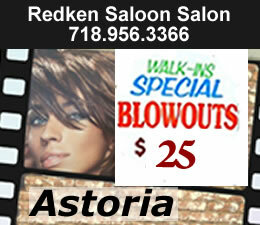 Click here for the Jackson Heights Corona Neighborhood section of this site. The Louis Armstrong House is located at 34-56 107th Street in Corona. Wednesday, July 4, 2018 - from 2 - 4 pm - Hot Jazz Cool Garden features Terrell Stafford. $20. Saturday, July 14, 2018 - from 2 - 4 pm - Hot Jazz Cool Garden features Byron Stripling. $20. Saturday, August 4, 2018 - from 2 - 4 pm - York College Summer Jazz Concert. The York College Summer Jazz Program is tuitiion-free and showcases outstanding NYC high school musicians. Free. Saturday, August 11, 2018 - from 2 - 4 pm - Hot Jazz Cool Garden features Bria Skonberg. $20. Thursday, August 23, 2018 - from 4 - 9 pm - Jazzmobile Block Party featuring Jeremy Bosch Quartet at 5 pm and Roland Guerrero at 7 pm. Free. Saturday, September 8, 2018 - from 2 - 5 pm - Kupferberg Center for the Arts presents Magos Herrera. $20. Tickets cost $20 in advance / rsvp at the www.louisarmstronghouse.org or call 718-478-8274. 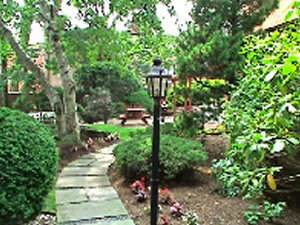 The photo above right was taken in the Garden of the Louis Armstrong House. Click here to view a map of the stage at 111th Street and 53rd Avenue in Flushing Meadows Corona Park [TBD] in Flushing / Corona. The following is a schedule of summer concerts at 111th Street at 53rd Avenue in Flushing Meadows Corona Park in Flushing / Corona. The concert times and locations vary with the first at 111th Street at 53rd Avenue in Flushing Meadows Corona Park in Flushing / Corona and the second at the Unisphere near the Queens Museum. Tuesday, July 31, 2018 - Live Music with Darlene Graham - concerts run from 11 am to 12 noon at 111th Street at 53rd Avenue. Wednesday, August 15, 2018 - Salsa Warrior - concerts run from 7 to 9.30 pm at the Unisphere in Flushing Meadows Corona Park. Click here to view a Flushing Meadows Corona Park map. The photo to your right was taken at a Passport performance by the Queens Museum Of Art. Click here for the Flushing Neighborhood section of this site. The following is a schedule of summer concerts in Flushing Meadows Corona Park. Thursday, July 12, 2018 from 7 - 10 pm - INDIA. At 7 pm "get your body moving with Masala Bhangra: Bollywood dance workout classes from 7 – 7.45 pm on the front lawn of the museum starting at 8 pm [programs will take place inside the museum in event of rain]. At 8 pm Road (Dev Benegal, 2010, 95min, Hindi with English subtitles) about "Vishnu, a restless young man, itches to escape his father’s faltering hair oil business. As his ticket to freedom, he offers to drive an antique Chevy across the desert to the sea, where it has been sold to a local museum. As he sets off, he discovers he’s not merely transporting a battered vehicle, but an old touring cinema." Thursday, July 19, 2018 from 7 - 10 pm - ECUADOR. At 8 pm a film entitled How Much Further / Que Tan Lejos (Tania Hermida, 2006, 92 min, Spanish with English subtitles) about "Esperanza and Tristeza both have to get to Cuenca. However, by an unlucky turn of events, the bus they are on gets delayed due to a worker strike. Taking their journey into their own hands, they decide to hitchhike to Cuenca. Along the way they meet interesting characters who help them re-evaluate the purpose of their journey." 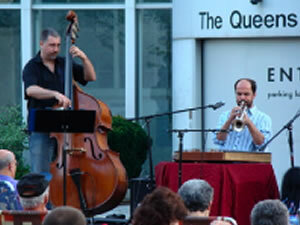 - free summer concerts & movies in front of the Queens Museum. Thursday, July 26, 2018 from 7 - 10 pm - GHANA. At 8 pm a film entitled Keteke (Peter Sedufia, 2017, 70 min, English) about "It’s the 80s rail service system in Ghana, and the train is the only means of transport from the outskirts. A couple – BOI and ATSWEI is bent on delivering their first baby in Akete but misses their first train. A wrong decision finds them in the middle of nowhere. Will they make it on time for the delivery, or, risk losing the baby and mother?" - free summer concerts & movies in front of the Queens Museum. Thursday, August 2, 2018 from 7 - 10 pm - COLOMBIA. At 8 pm a film entitled The Wind Journeys / Los Viages del Viento (Ciro Guerra, 2009, 120 min, Spanish and indigenous Colombian languages of Palenquero, Wayuunaiki & Ikun with English subtitles) about "Traveling musician Ignacio Carrillo (portrayed by real-life musician Marciano Martínez) goes on a mystical quest across the Colombian Caribbean to return his Devil-cursed accordion to the man who gave it to him. On the way, Ignacio is followed by Fermin, a spirited teenager determined to become his apprentice. 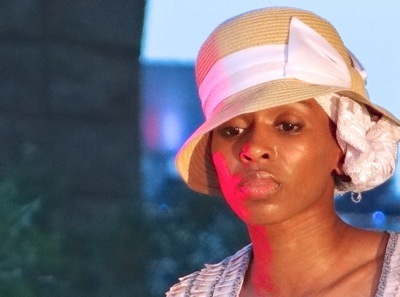 This film contains scenes that may be unsuitable for children." - free summer concerts & movies in front of the Queens Museum. Thursday, August 9, 2018 from 7 - 10 pm - DOMINICAN REPUBLIC. At 8 pm a film entitled On The Road Somewhere / Algun Lugar (Guillermo Zouain, 2015, 71 min, Spanish with English subtitles) about "After finishing high school, teenagers Oliver, Moises, and Hemingway go on an emotive journey through the Dominican Republic in search of their life calling. Politics, pop culture and national identity emerge as they embark on a carefree road trip before college, when the first steps into adulthood begin and everything they know will change." - free summer concerts & movies in front of the Queens Museum. **In case of rain, performances will be held inside Queens Theatre in the Park and admissions will be made on a first come, first serve basis. Seating capacity is 472. Friday, August 12, 2016 - from 10 am - 5 pm - Taiwan: A World of Orchids provides a display of orchids and a weekend of live music. Click here to go to the free summer theater in Queens & scroll down to Queens Theatre in the Park for some free theater in the park in Queens this summer. Click here to view a Flushing Town Hall map. 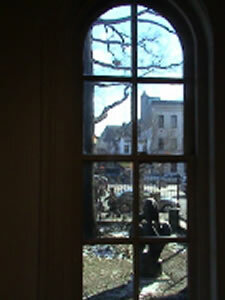 The photo to your right was taken looking out of one of the exhibit rooms at Flushing Town Hall. The following is a schedule of a couple of free summer concerts in Flushing. Click here for the Flushing Neighborhood section of this site. Last year Flushing Town Hall hosted some of the Asian International Film Fest. This year it will only be available in Manhattan. July 25 - August 4, 2018 - Asian American International Film Festival. This is being held entirely in Manhattan at the Village East Cinema, the Asia Society on the Upper East Side, Muses 35 & Karaoke and Asian American Research Institute CUNY. Unfortunately I think there may not be any Queens free summer movies at Flushing Town Hall this year. Click here for a listing of all free summer movies in Queens. Click here to view a map of the George Seuffert Bandshell in Forest Park [TBD] in Forest Hills. The following is a schedule of summer concerts in the Rockaways. The concerts run from 7.30 to 9 pm at the George Seuffert Bandshell in Forest Park in Forest Hills. Thursday, August 2, 2018 - Parrot Beach playing Jimmy Buffett Tribute - concerts run from 7.30 to 9 pm at the George Seuffert Bandshell in Forest Park in Forest Hills. Thursday, August 16, 2018 - Four Tops Revue w/ former Lead Singer of Theo Peoples - concerts run from 7.30 to 9 pm at the George Seuffert Bandshell in Forest Park in Forest Hills. Click here to view a Travers Park map. 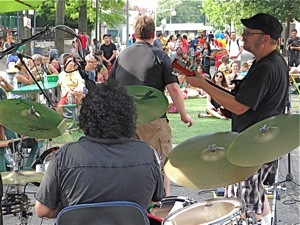 The photo to your right was taken at a Summer Sundays concert in Travers Park in a prior year. 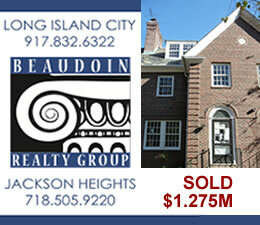 Click here for the Jackson Heights Neighborhood section of this site. The following is a schedule of summer concerts in Travers Park at 34th Avenue and 78th Street in Jackson Heights. Sunday, July 1, 2018 – begins 4 pm - Jackson Heights Orchestra plays classical music. Sunday, July 8, 2018 – begins 5 pm - King Solomon Hicks plays rhythm & blues and jazz. Sunday, July 15, 2018 – begins 4 pm - DJ Distraction & Chee Malabar / E3 play rap and hip hop. Sunday, July 22, 2018 – begins 4 pm - Brooklyn Women's Raga Massive plays Indian classical music. Sunday, July 29, 2018 – begins 4 pm - Unlocking the Truth plays Heavy Metal. Sunday, August 5, 2018 - beginning at 4 pm - Mountain County plays bluegrass. Sunday, August 12, 2018 – beginning at 4 pm - Goussy Celestin's Ayiti Brass plays an eclectic mix of Haitian hyms and New Orleans jazz. Sunday, August 19, 2018 – beginning at 4 pm - The Crimson Ragdolls play a mix of blues, ragtime, gospel and folk. Sunday, August 26, 2018 - beginning at 11 am - PuppetMobile is performing The Big Good Wolf and then starting at 2 pm the Theatre for a New City (Theater). This theater group has been providing free operetta-for-the-streets to communities throughout New York City since the early 1970s. Click here to view a King Park map. These events are all free things to do on Saturdays at King Manor. The photo to your right shows King Manor in King Park on Jamaica Avenue at 153rd Street in Jamaica. Click here for the Jamaica Neighborhood section of this site. Saturdays, June 2, 9, 16 & 23, 2018 - The Jamaica Dance Festival - at 7.30 pm on the front lawn of Rufus King Manor in Jamaica. In 2017 they had done a weekly event in July and August / ditto in 2016. The performance groups are in chronological order - Sonali Skandan & Jiva Dance 6/2, Vissi Dance Theater 6/9, Harlem Stage E Moves 6/16 and Capulli Mexican Dance Company 6/23. OUTDATED _ Saturday, June 24, 2017 beginning at 12 noon / Free - King Manor Summer Festival - featuring things to do with the kids. Films, Fridays, July 20, 27 & August 3, 2018 - the past few years [2015, 2016 & 2017] films have been shown in the park on Friday evenings at sunset which begins at 8 pm'ish. Friday & Saturday, August 3 & 4, 2018 Jamaica JAMS Festival - On Friday evening there's a live music festival in Rufus King Park at 153rd Street & Jamaica Avenue beginning around 7 pm. The music festival is usually found in the northwest corner of the park. On Saturday Jamaica and Queens biggest street fair runs all day Saturday [10 am - 6 pm] along Jamaica Avenue from Rufus King Park east about 10 - 20 blocks. 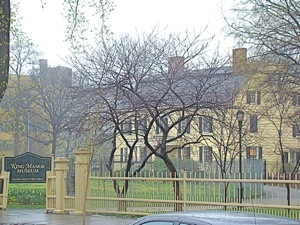 Saturday, September 1, 2018 - Hands on History: 18th Century Music - from 1 to 4 pm there's a performance and a workshop for making an 18th century musical instrument at Rufus King Manor. Click here to see free movies in the park in Jamaica & Queens on this site. Concerts run from 12 noon - 9 pm from June 30 thru September 1, 2018 at 22-15 Jackson Avenue in LIC. $18 / $22. Saturday, June 30, 2018 from 12 noon – 9 pm - expired. Saturday, July 7, 2018 from 12 noon – 9 pm - expired. Saturday, July 14, 2018 from 12 noon – 9 pm -expired. Saturday, July 21, 2018 from 12 noon – 9 pm -expired. Saturday, July 28, 2018 from 12 noon – 9 pm - expired. Saturday, August 4, 2018 from 12 noon – 9 pm -Laff Trax (Toro y Moi + Nosaj Thing) / Madam X / Leon Vynehall / Photay / Starchild & The New Romantic / Mana. Saturday, August 11, 2018 from 12 noon – 9 pm - Omar-S / Axel Boman / Jon Bap / Jennifer Cardini / Standing on the Corner / Molly / DJ Sanna. Saturday, August 18, 2018 from 12 noon – 9 pm -OG Ron C & The Chopstars / Maxo Kream / Bali Baby / Jubilee / Cuban Doll / World's Fair / Injury Reserve / Kelman Duran. Saturday, August 25, 2018 from 12 noon – 9 pm -Soul Summit / HoodCelebrityy / Kelsey Lu / Epic B b2b Uninamise / Anik Khan / slowthai / Enrique. Saturday, September 1, 2018 from 12 noon – 9 pm -Discwoman / Gang Gang Dance / Lizzo / The Italian New Wave / Logan Takahashi. Click here to view a Queensbridge Park map. Click here for the Long Island City Neighborhood section of this site. The following is a schedule of summer concerts in Queensbridge Park. Thursday, July 12, 2018 beginning at 7 pm / Free - Systema Solar / Very Be Careful, in association with the Latin Alternative Music Conference. Friday, July 13, 2018 - from 7 - 9 pm / Free - featuring Calpulli Mexican Dance Company. Saturday, July 14, 2018 - from 4 - 7 pm - featuring TBA. Sunday, July 15, 2018 - from 4 - 7 pm - featuring Jungle Brothers and Friends / O.C. / Kool DJ Red Alert / with special guest DJ KOOL FLASH. Second Thursdays, June 14, 2018 from 6.30 to 8 pm - Jazz at Socrates Sculpture Park. Free. Saturday, June 29, 2018 from 7 - 8.30 pm - The SummerStage & Metropolitan Opera Summer Recital Series returns with a concert of arias and duets. The concert features Gerard Schneider, Gabriella Reyes della Ramirez and Adrian Timpau. Second Thursdays, July 12, 2018 from 6.30 to 8 pm - Jazz at Socrates Sculpture Park. Free. Saturday, July 28, 2018 from 3 - 7 pm / Free - Ralph McDaniels Hip Hop in the Park - "legendary VJ, producer, and hip hop pioneer Ralph McDaniels to present Hip Hop in the Park, a family-friendly festival celebrating the four elements of hip hop – emcees, DJs, dance troupes, and graffiti art – and 35 years of McDaniels’ groundbreaking music video program, Video Music Box. Join us for this exciting afternoon of FREE entertainment including an old school hip hop jam, youth performances, art-making activities, and food." Sunday, July 29, 2018 from 2 - 5 pm / Free - Ballet Folklorico Mexicano de Nueva York Guelaguetza Festival - Socrates website tells us, "one of the most vivid expressions of Mexican culture: the 6th annual Guelaguetza Festival New York City comes to Socrates Sculpture Park for a cultural celebration of joy and pride through music, dance, and crafts from the eight regions of the state of Oaxaca. The festival is the most celebrated event in Mexico, brought to New York by Ballet Folklórico Mexicano de Nueva York (BFMNY) since 2013. BFMNY is a non-profit organization founded in 1983, celebrating 35 years of proudly promoting Mexican culture and tradition." Saturday & Sunday, August 4 & 5, 2018 from 1 pm - 8 pm / Free - INSITU Dance Festival - a two-day site-specific choreographed dance festival simultaneously performing at Socrates Sculpture Park, Gantry Park, Queensbridge Park and Hunters Point Park in Long Island City along the waterfront. Go to www.insitudancefestival.com for details of specific performances and locations within the parks. Second Thursdays, August 9, 2018 from 6.30 to 8 pm - Jazz at Socrates Sculpture Park. Free. Sunday, August 12, 2018 beginning at 4.30 pm [kids] & 5 pm / Hip to Hip Theater Free - All's Well - The play of All's Well That Ends Well is a romance about the trials and tribulations of mating in the 1600's. See August 11 for events on August 18 & 25 entitled Dance at Socrates. Sunday, August 19, 2018 beginning at 4.30 pm [kids] & 5 pm / Hip to Hip Theater Free - King Lear - The tragic play of King Lear is about a king, who at his daughters' urging, splits his kingdom and gives it to his heirs - the daughters. Jealousies, greed, conflict and death ensue. See August 11 for events on August 25 & 18 entitled Dance at Socrates. Saturday, September 1, 2018 from 3 - 4 pm / Free - Circus Amok - "Using a blend of traditional circus skills, post-modern dance and improvisational techniques, Circus Amok provides free public art addressing issues of social justice to audiences of all ages." Click here to view a Hunters Point South & Gantry Park map. 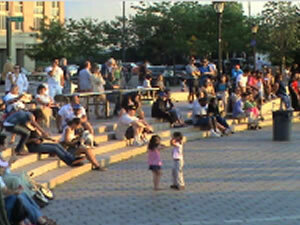 The photo to your right shows the audience watching a Live at the Gantries performance in Long Island City. Click here for the Long Island City LIC Neighborhood section of this site. The following is a schedule of summer concerts in Hunters Point South Park - just south of Gantry State Park in Long Island City LIC. 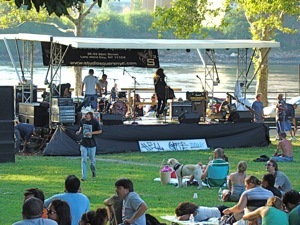 The concerts run from 6 to 8 pm every Thursday in July and August at LIC Landing which is near the East River Ferry station& cafe. July & August Every Thurday 2018 - concerts run from 6 to 8 pm in LIC every Thursday in July and August. Click here to view a map of the Rockaways [TBD] near Beach 94th Street off Shorefront Parkway in Rockaway Beach. The following is a schedule of summer concerts in the Rockaways. The concerts run from 7.30 to 9 pm at Beach 94th Street, off Shorefront Parkway in Rockaway Beach. Wednesday, August 1, 2018 - Live Acoustic Rock & Roll Band - concerts run from 7.30 to 9 pm in Rockaway Beach at 94th Street. Wednesday, August 8, 2018 - Live Acoustic Rock & Roll Band - concerts run from 7.30 to 9 pm in Rockaway Beach at 94th Street. Wednesday, August 15, 2018 - Live Acoustic Rock & Roll Band - concerts run from 7.30 to 9 pm in Rockaway Beach at 94th Street. Sunday, August 19, 2018 - Dr. K's Motown Revue - from 6 to 7.30 pm. At O'Donahue Park at the Boardwalk and Rockaway Beach. Wednesday, August 22, 2018 - Live Acoustic Rock & Roll Band - concerts run from 7.30 to 9 pm in Rockaway Beach at 94th Street. Wednesday, August 29, 2018 - Live Acoustic Rock & Roll Band - concerts run from 7.30 to 9 pm in Rockaway Beach at 94th Street. Click here to view a Springfield Park map - TBD. The following is a schedule of summer concerts in Springfield Park at 184th Street and 146th Terrace in Springfield Gardens & South Jamaica Queens. July 5, 2017 from 7 - 9 pm / Free - Just Sole! Street Dance Theater Company / Pretty BIG Movement - featuring "Spirited hip-hop dance crews inspire while defying stereotypes and starts with dance workshop." Thursday, July 5, 2018 beginning 7 pm / Free - featuring RAM / Paul Beaubrun / DJ Hard Hittin Harry, in association with Afro-Latino Festival. Friday, July 6, 2018 beginning 7 pm / Free - featuring The Legendary Ladies of SKYY / Rhythm Revue with Felix. Saturday, July 7, 2018 beginning at 4 pm / Free - featuring Kranium / Federation Sound / DJ Polish (KING MIDAS). Sunday, July 8, 2018 beginning 5 pm / Free - featuring EPMD / DJ Sylk. Tuesday, August 7, 2018 from 4 to 9 pm - Bix Biederbecke Memorial Jazz Concert - free jazz concert in memoriam of short-lived jazz musician Bix Beiderbecke who lived in Sunnyside only blocks away. At 46th Street under the tracks at Queens Blvd. Tuesday, August 21, 2018 from 4 to 7 pm / Free - Paul Maringelli & the Rockabilly Band - a classical rock band. Tuesday, September 18, 2018 from 4 to 7 pm / Free - McManus Irish Dance - a classic & modern Irish dance group. Click here to view a Windmuller Park map where you must then grab the map and head due north to 58th & Broadway. 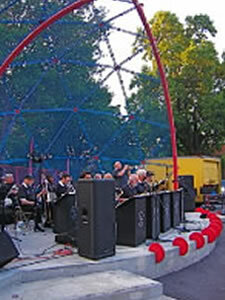 The photo to your right shows a live concert by a big band group at Windmuller Park in Woodside many years ago, but these concerts appear to have been put on hiatus. Click here for the Woodside Sunnyside Neighborhood section of this site. There was a schedule of summer concerts in Sargeant Collins Park in Woodside in 2015, but I believe the organizers discontinued the concerts thereafter, and in 2016 began showing free summer movies in Woodside at Sargeant Collins Park. That too appears to have been discontinued. At this point we're not expecting summer concerts in Sargeant Collins Park. 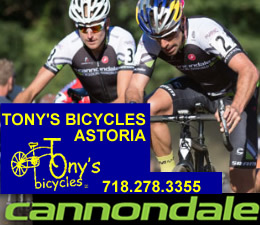 Click this link to go to the Bike Repairman home page - Bike Shops in Astoria, the Bike Stop home page Bicycle Shops In Astoria, or Tony's Bike Home page Bike Shops in Queens. 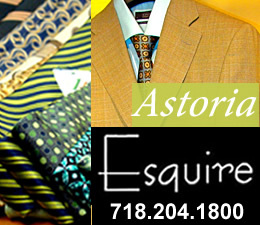 Click this link to go to the Astoria Neighborhood / Astoria Restaurants / Astoria Shopping Center & Map. 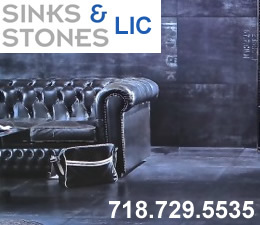 Click this link to go to the LIC - Long Island City Neighborhood / LIC - Long Island City Restaurants / LIC - Long Island City Shopping Center & Map. 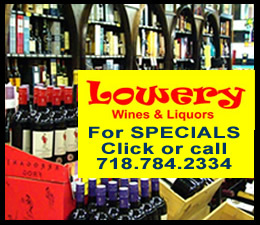 Click this link to go to the Jackson Heights neighborhood / Jackson Heights Restaurants / Jackson Heights Shopping. 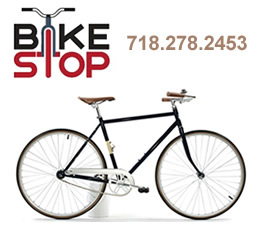 Click this link to go to the Sunnyside Woodside neighborhood / Woodside Sunnyside Restaurants / Woodside Sunnyside Shopping. 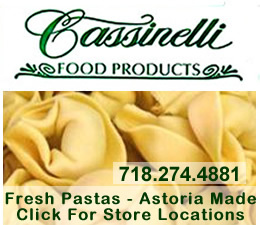 Click this link to go to the Flushing neighborhood / Flushing Restaurants / Flushing Shopping. 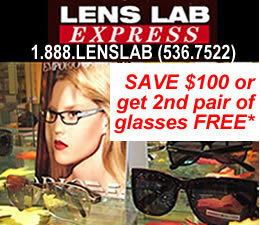 Click this link to go to the Jamaica neighborhood / Jamaica Restaurants / Jamaica Shopping.